You can't walk in the port area and have to be shuttled by the ship's coach to a car park in town if going there. The main reason for being here is to visit either Petra or the Dead Sea and as the port for that it serves well. Aqaba is the other main stop for visitors, primarily for its excellent diving and snorkelling, though it’s gaining ground quickly as a regional winter resort. Shuttles are usually provided into town, a 4 km ride. Situated at the top of the Gulf of Aqaba, Aqaba is the only access by sea to Jordan. Cruise ships call at the Red Sea which is famous for coral reefs, excellent diving, and sandy beaches. Its calm waters make it an ideal spot for water-skiing, wind-surfing and scuba diving. There are a number of diving centers in Aqaba, where the novice may take lessons, or, for the more experienced diver, it is possible to rent gear and dive with local guides. Coral formations on the reef are said to be among the most spectacular in the world and many are close enough to the surface for an amateur snorkeler to view with ease. Trips in glass-bottomed boats can also be arranged. The aquarium, situated in the Marine Sciences center, on the Corniche, southeast of the town, has much exotic marine life on view, for those not wishing to get wet. Aqaba Fort. Originally dating to the 14th century, although the present structure was built by the Mamluke sultan Qansawh el-Ghawri (1501-1516) and has been revised many times since then. At the gate, cabs are waiting to take you into town, or you can walk another 15 - 20 minutes to reach Aqaba Castle. Taxi are fairly available in the city. A ride within town should cost no more than 2JD. A ride outside town (to a beach near by or to any border crossings) costs around 3JD. A taxi for an all day Petra round trip is now 74JD or Euro 80. People going independently must be aware that the entrance fee to Petra is £50(sterling) per person! 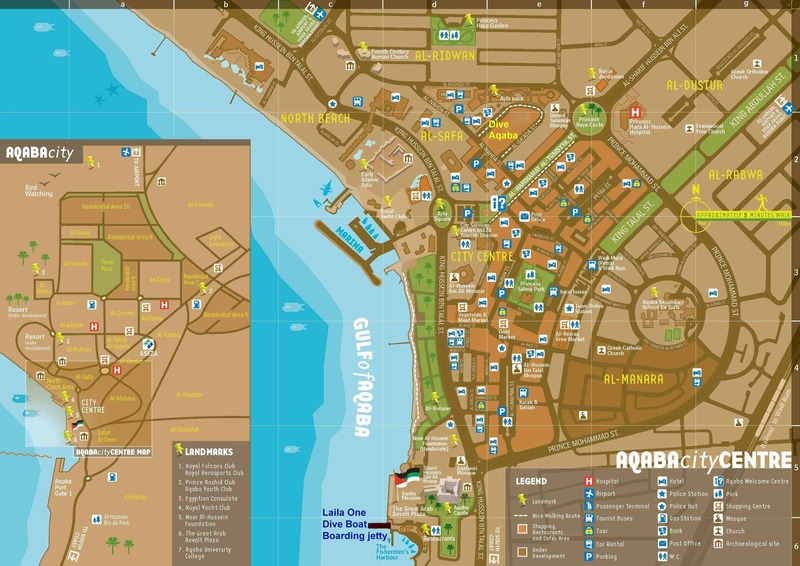 Aqaba is relatively close to both Wadi Rum and Petra. Public buses go to both, but only depart when there are enough passengers. Alternatively, there are a lot of tour companies around town who would happily arrange excursions, in particular to Wadi Rum. Aqaba is the port of entry for visiting Petra, Jordan's best-known tourist attraction and one of the great wonders of the Middle Eastern world. This city was carved straight into solid rock and unfolds grandly after a two-kilometer (1.2-mile) walk through a very narrow chasm which only adds to its mystery and grandeur. Built during the fifth and sixth centuries BC, Petra is the ruined capital of the Nabatean Arabs. Its immense facades were lost for almost 1000 years, however, until rediscovered by the Swiss traveler Johan Ludwig Burckhardt in 1812. Today, there are still many sites to see including the el Khazneh (The Treasury) monument, which is a giant tomb carved out of rock, the Temple of the Winged Lions, the al-Deir (Monastery) and the small Archaeological Museum, which displays artifacts found at Petra during the 19th and 20th centuries. Wadi Rum is a spectacular desert valley about an hour north of Aqaba in the Jordan desert, which was loved by the British adventurer T.E. Lawrence (Lawrence of Arabia). Its beautiful rocky cliffs and brilliant colors of red, brown, and orange set Wadi Rum apart from other desert areas. Visitors to Wadi Rum can explore the area on foot, via camel, donkey, or 4-wheel-drive covered jeep. A cruise ship organized excursion might be your best bet here. Special items include Hebron glass, mother-of-pearl boxes, pottery, backgammon sets, embroidered table cloths, jeweled rosaries and worry beads, nativity sets made of olive wood, leather hassocks, old and new brass and copper items, caftans hand-embroidered with silver and gold thread. Jordan is also famous for its gold and silver. Necklaces with a small golden coffee pot (dalleh) – a national symbol – are popular and widely available. Some places i.e McDonalds accepts payment in US Dollars but gives change in Jordanian Dinars. McDonalds and Ali Baba restaurant near the market offer free WiFi. Aqaba works on siesta time; everything shuts down around 3pm (or earlier) and reopens later in the evening, from around 6pm.